Varies by length and manufacturer, generally $0.20 - $0.30 per foot. Varies by length and manufacturer, with $0.40 - $0.60 per foot as an average; generally about 20% higher than Cat5e. 100 meters 100 meters for slower network speeds (up to 1,000 Mbps) and higher network speeds over short distances. For Gigabit Ethernet, 55 meters max, with 33 meters in high crosstalk conditions. Both Cat5e and Cat6 are twisted pair cables that use copper wires, typically 4 twisted pairs in each cable. The specification for Cat6 features more stringent specifications for crosstalk and system noise, and provides performance of up to 250 MHz. Cat5e, in contrast, performs up to 100 MHz. This was often achieved using a spline (a longitudinal separator) in the wiring, which isolates each of the four pairs of twisted wire. However, this made Cat6 cables more rigid; newer cables use other methods to reduce noise and are more flexible. Regardless of whether a spline is used, a cable that meets Cat6 specifications provides significantly lower interference or near end crosstalk (NEXT) in the transmission. It also improves equal level far end crosstalk (ELFEXT), return loss and insertion loss compared with Cat5e. The result is less noise, fewer errors and higher data rates in the transmission of the signal. The category is almost always printed on ethernet cables. It is not possible to identify cable categories by color, but Cat6 cables are often thicker than Cat5e because it uses thicker copper wires. Both Cat5e and Cat6 cable specifications allow lengths up to 100 meters, but Cat6e has a lower max length (55 meters) when used for 10GBASE-T (10 Gigabit Ethernet). 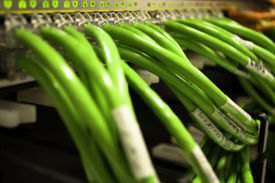 In order to run 10GBASE-T for 100 meters, Category 6a cable, or Augmented Category 6, cables need to be used. Cat6a cables allow performance up to 500 MHz. As mentioned previously, Cat6 cables can be used to power 10GBASE-T, or 10 Gigabit Ethernet, while the maximum that Cat5e cables can support is 1GBASE-T, or 1 Gigabit Ethernet. This is because Cat6 cables perform up to 250 MHz, more than twice that of Cat5e cables (100 MHz). The price of ethernet cables vary by length, manufacturer and seller. In general, Cat6 cables are 10-20% more expensive compared with Cat5e cables. However, cables are generally cheap and the speed boost offered by Cat6 cables usually makes the price premium well worth it, even for home use. Cat5e cables seem to be more popular on Amazon.com. Only 2 of the top 20 best selling ethernet cables on Amazon are Cat6.